We have developed a new-type silicon photomultiplier that surpasses existing solutions by order of magnitude in dynamic range, sensitivity and amplitude noise level. This combination of parameters achieved simultaneously allows our detector to excel in LiDAR and other applications where high sensitivity under conditions of strong background illumination is crucial. We are a start-up company consisting of physicists, technologists and entrepreneurs. We work with silicon foundries to manufacture our detectors in accordance with our proprietary IP, processes and specifications. We are interested in partnerships, including joint patent solutions, with manufacturers of microelectronics and optoelectronics devices, as well as developers of optical information systems who are looking for competitive advantage in LiDAR, medical imaging and other applications. New generation of solid-state photomultiplier for detecting and analyzing optical signals in the visible range with a wide dynamic range along with high sensitivity, short recovery time, and low noise. Combination of such parameters should significantly increase market share of the solid-state photomultipliers in medical applications, biotechnology, industrial and radiation measurements, high-energy physics, and pollution monitoring, thus facilitating replacement of vacuum photomultiplier tubes (PMTs), which have no alternatives nowadays. Any existing solid-state device is a trade-off between the two key parameters: dynamic range and photosensitive area. Dynamic range is governed by the cells density while photosensitive area determines photo-detection efficiency (PDE). To escape from this trade-off we developed a new design DEPHAN solid-state photomultiplier with avalanche miniaturized amplifying channels. 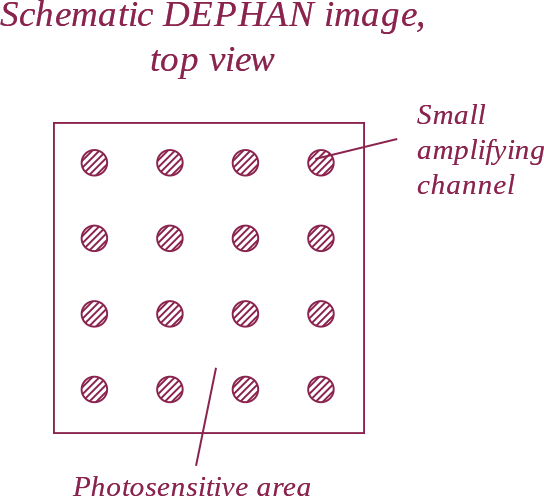 Pilot prototypes of the solid-state photomultipliers DEPHAN with 1×1 mm2 surface area have amplification channels (cells) density 4.4×104 mm-2 with light-sensitive area (fill-factor) 0.83. For comparison, the main competitor in dynamic range of the developed device has surface area 1×1 mm2 with 104 pixels and fill-factor 0.33. Thus, it makes possible further increase of cell density and, consequently, and dynamic range in future. Pulse pair resolution 1 ns. Patent applications for the developed devices are pending the Russian Federal Service for the Intellectual Property (including application under the Patent Cooperation Treaty, PCT). Replacement of vacuum photomultipliers (PMTs) with a solid-state – one of the DEPHAN’s goals. The two principal technical solutions proposed and realized by the authors of the project Dr. Shubin and Dr. Shushakov in the middle of the 1990s made it possible to solve the ultimate problem of signal detection: analog detection with single-electron sensitivity threshold. The first one is effect of self-calibration of current cord provoked by a single electron in avalanche structure with negative feedback in conditions of above-critical voltage. This effect allows one to realize a single-electron threshold amplifier with high response probability and stable calibrated output signal. The second is utilization of avalanche structure with negative feedback in the above-critical “Geiger” mode and merging output signals emerging from such structure of threshold single electron amplifiers for the purpose of analog signals detection. 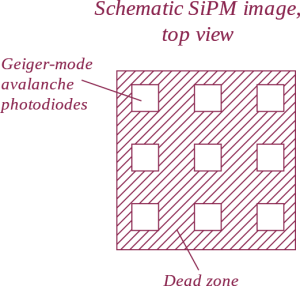 Since the beginning of 2000s the research group under supervision of Dr. Shubin develops alternative to conventional SiPMs approach to design of multicell solid-state photomultipliers with wide dynamic range. The Russian Quantum Center opens a new research direction for DEPHAN analog photodetectors with increased dynamic range, high sensitivity, high speed and low intrinsic noise. DEPHAN is registered as a company. Start of interaction with the fab. Key elements of manufacturing technology are set up and refined on top of standard fab processes. Project is presented before Skolkovo Foundation grant committee and wins 3 year grant. Applications for Patent Cooperation Treaty (PCT) and Russian patents are filed. Technology is proven experimentally: experimental sample is produced with 1х1 mm2 surface area, 4.4х104 mm-2 amplification channels (cells) density and light-sensitive area (fill-factor) of 83%. Test sample of SSPM DEPHAN is obtained. Preliminary evaluation of test sample against commercial SSPMs in typical application tasks (LiDAR, Hi-Res PET) displays the potential of new technology in a range of applications. Preliminary data-sheet of the new SSPM is composed based on test sample measurements. Patent applications are submitted for national phases (USA, Japan, and Europe). Device construction and main achieved parameters are presented and published on Photonics West 2018. Manufactured the test samples with enhanced parameters customized on area and spectral response for several applications, as well as the 2×2 matrix prototype. Constuction of demonstrational LiDAR device utilizing the test sample of SSPM DEPHAN. Evaluation of customized devices for several applications (LiDAR, Medical Imaging, 3D imaging, Nuclear Science). Publication of the results. Manufacture of customized test samples optimized after results of evaluation. Business-center "Ural", 100, Novaya street, Skolkovo, Moscow, 143025 RUSSIA. © 2019 DEPHAN LLC. ALL RIGHTS RESERVED.